I think the reference to money aggregates and balance sheets and oil and gold refers to inflation about to happen, but hasn’t shown up in the data. Well, individuals like the aforementioned reader have been predicting inflation — actually hyperinflation — for a couple of years, and it hasn’t shown up yet, so I decided to look at the evidence in favor of the hyperinflation-in-the-near-future thesis (I call this the “Apocalypse Soon” scenario). This entry was posted on August 22, 2011 by Menzie Chinn. No, the reader referenced gold because he can string an argument on it. If widgets were soaring or oil paintings, that might be the argument: identify something going up in value and say the dollar is falling relative to that. We need a big QE3, period. People have no idea how much deflationary overhang there is in the housing market, compounded by aging demographics, compounded by the otherwise-good effects of Moore’s Law. A big QE3 is needed. I hope they do it now rather than wait until October. People clinging to the fact that gold is rising are somehow ignoring the fact that oil has fallen a lot. Note that about 101% of the net increase in world Gold demand is from just one country – India. Gold is part of their culture, and their economic growth is creating more gold-buying. That should not be read into as a major economic indicator at this time. Oil is a bigger indicator. I think gold as an indicator of inflation is an outdated 20th-century paradigm. Why not use oil? People need oil every day, but don’t necessarily need gold every day. Or, better yet, why not come into the 21st century and use MIPS of processing power, TB of storage, or GB of RAM as a commodity to measure inflation against? The price of most goods measured in these terms has been dropping by 30-50%/year. How many TB of storage costs the same as a gallon of milk in 2008? 2011? 2012? Now if one weren’t a group-thinking modern macroeconomist, one might be able to imagine a time in Roman, French, British, or other history when the precious metal content of coins was reduced (i.e. “debased”) but the prevailing economic conditions at the time were such that rapid consumer price inflation did not immediately occur. If one really wanted to exercise the old gray matter, one might imagine an equivalent thing happening today, with dollars increasing in quantity and decreasing in quality, with no significant concurrent price index increase. I know it’s very hard for modern economists to think outside of the rigid theoretical frameworks handed to them by their professors, but give it a try some time. You might learn something. Secondly, despite your best efforts to find predictions of immediate hyperinflation on my blog, you found no such thing. What you found was a link to other discussion that our borrowing/spending ratio is in the danger range that Professor Peter Bernholz found is commonly a tipping point for economies. I maintain to this day that our serial 10% GDP deficits are extremely dangerous, but I do not predict near-term hyperinflation. If you’re going to wrongly attribute claims of immediate hyperinflation to me, would you at least do me the honor of giving me credit for the repeated calls to buy gold over the last six years? Those calls have been very successful long prior to gold’s headlines in the popular media and despite there being no “inflation” by your definition. Finally, no, I wasn’t defending Rick Perry. He’s a moron. It’s tragic that academia is no longer about the inquisitive pursuit of knowledge but the incurious, narrow-minded defense of doctrine. I pity the current crop of university students. W.C. Varones: Oh, sorry. I misunderstood the text of your post, titled Hyperinflation tipping point. Mea culpa. By the way, why do you keep on referring to Fed Chairman Bernanke as “Zimbabwe Ben”. But I understand that you definitely, absolutely, are making no references at all to hyper -inflation. By the way, I didn’t say you were defending Governor Perry; merely that you were defending his assertion of debasement. There is a difference. There is less chance of hyperinflation in the next 24 months than there is of discovering ET (i.e. extremely low chance). Even after QE1 and QE2, inflation is barely at 2%. The definition of ‘hyperinflation’ has itself been scaled down to 4% inflation, a figure that was quite acceptable in the 80s and early 90s. There will NOT be a single future calendar year in the US that has a 5% rise in the CPI. Never. No, the reader referenced gold because he can string an argument on it. Erm, no. I’ve been talking about gold for years before its recent rise, and regardless of its recent performance, it continues to hold its ancient and time-honored place as a store of wealth because it can’t be printed — the one thing that differentiates it from infinitely printable fiat currencies. I didn’t cherry-pick gold because of its recent performance. 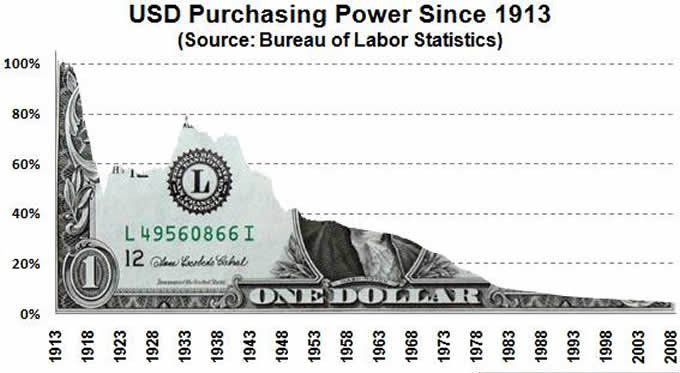 It is what it always has been, and fiat currencies are still collapsing around it just as they always have. Please don’t debase yourself by responding to red herrings from austrian dogmatists! You’re a better economists than this and any discerning reader won’t be led astray by such a comment. Devote your time to higher mp writings! The inflation bug’s mind works on the basis of fear; specifically the fear that rising prices deter and ultimately destroy savings and investment. And the inflation bug is 100 percent correct. To see this, all we need to do is to compare the price level for consumer goods and services today with the level prevailing in 1933. Yes, that’s right; prices today are much higher than they were in 1933. And what has been the effect? Yes, just as the inflation bugs predicted, investment has plunged dramatically in the last 75 years, rendering the U.S. a byword for staggering economic decline. And those living on fixed incomes or from savings have, en masse, been forced to beg whatever crumbs they can garner from illegal immigrants working as crop pickers or car washers. The creation of Social Security merely exacerbated the pauperism that our decades-long monetary inflation has wrought. The only exceptions are those wise and fortunate souls who have hoarded gold. If only we as a nation had not inflated our currency starting in 1933, our children and grandchildren would have enjoyed all the marvellous pre-1933 era blessings afforded by Sound Money policies. But the inflation bug at least can be consoled by the KNOWLEDGE that he was RIGHT, and that the inflationists were wrong. Now, there are some who will say the right-wing inflation-haters are merely absurd cranks, or absolutely whacko crackpots, or indescribably moronic simpletons, who are fed these stupendously erroneous ideas about monetary economics by the propaganda machine that serves the interests of the ruling plutocracy. But as the simple, clear, and dramatic analysis of the facts which I have provided above PROVES BEYOND ALL DOUBT, these idiotic douchebags actually have the facts on their side. Not, to be sure, the liberal-socialist-collectivist so-called facts, but the facts as derived from the ridiculous, off-the-wall, fruitloop worldview of the inflation bug. …You know full well that neither CPI nor the PCE are the same since the mid 90-ties, they are so heavily massaged by all sorts of adjustments that only the shadow stats numbers could be directly compared to pre Greenspan stats. Inflation shall be measured upon what is consumed, not over an arbitrary basket of goods, not over what is produced. Your inflation rate is based on what you consume personally, your company’s inflation rate is based on the price change in its inputs. Shadow stats CPI is 10%, BLS’ PPI is 7.2%, a far cry from the fictional CPI figures you are quoting that are based on the price levels of goods with lackluster demand. Demand is directly related to utility, hence even QE N^n will not produce demand for 2nd vacation homes amongst a retiring populace. Is it possible that although consumer goods are seeing a deflation, ‘investment goods’ are seeing an inflation, perhaps due to shortage of quality product? In the same way that the CPI can be falling but the price of apples can be rising? I haven’t thought this through but perhaps this explains a bit of the seeming paradoxes? We’ve now had two back to back posts on inflation-related topics. Is this really the key issue in the economy right now? The DOW lost 2,000 points in the last couple of weeks. I’ve read all the Rowling books and I never saw that spell. What’s it mean? *sigh* no one was worried about hyperinflation in 2005 and 2006.
gold is a bubble. every event is an excuse to buy it. the best is that its a safe haven. anything without yield and with no guarantee of principal return unless someone greater fool buys it at a higher price, with wild swings in prices of 20% over 3-5months, is not a “safe” haven… its a speculative one. You just gotta love unintentional irony! Menzie, can you please comment on one assertion that I have read, that if we measured inflation the exact same way that they did in the Carter administration, that we would have inflation rates the same as we had during the Carter administration? Here’s a piece of analysis I would have welcomed on Econbrower. Pretty straight-forward cyclical-vs-structural budget outlook. I would also still welcome an analysis of the fiscal, national debt, employment, and systemic financial impact of any potential downturn, given now that the odds of such a downturn exceed 50% based on oil prices, stock market declines, and the Philly mfg survey. I can’t put in words my refutation of your claim of stagnant prices. All I can do is tell you to run a household budget and ask if remotely resembles what the CPI says your prices should be. Do you pay the bills in your house, Menzie_Chinn? Hey GK, what a brilliant argument about computer prices! Seems like deflation must be pretty good then! Let’s have the Fed launch it in earnest! Oh, wait, you were probably about to deny any other relevance computer prices might have for monetary policy, weren’t you? What is the average growth of money supply that is consistent with the preservation of domestic employment without incurring further current account deficit? A currency debasement could happen when excessive credit supply (excessive means actual,total credit and loans at 340% of GDP) is driven towards imported consumers goods and increasing current account deficit. Yes, gold has no value in your models. Meanwhile, gold owners are stupid all the way to the bank. As you write write these posts from the Ivory Tower professor, you might want to look up from your keyboard to notice the Cheshire cat in the corner of the room. Those of us who live in the real world know that because Apple Computers comes out with an Ipod every week doesn’t mean that prices are deflating, we know that when a truck built two weeks ago is discounted after the model year changes a week later does not indicate deflation and that when packaging for everyday products start shrinking to containing less product that that is an indication of inflation. When CPI ran hot last week, be honest you changed it’s characterization to fit your narrative with one word, ‘transitory’. Well, how about stickiness? I sincerely hope that you aren’t so flippant with your students this semester. I thought money as a “good” was what could allow goods to go into a general glut (frustrating Say)and the resulting over-demand for “future money” would result in inflation in whatever version of “future money” that the market heard collectively crowded into, with excess capital = failed investment. You do a good job of putting forward the thesis, “there is little if any risk of high and volatile inflation.” Another tack would be to detail exactly what the Fed would have to do to increase the risk of high and volatile inflation. Or, more precisely, at what point would you want to initiate or increase your personal hedge against inflation risk, and what asset would you use? In my own experience, I judged the risk of high and volatile inflation to start rising, from extremely low levels, when the Fed abandoned its policy of “opportunistic disinflation” in favor of “fight deflation at all costs” in 2002. In response, I decided to purchase a crude but effective hedge. I have held the asset since as each major action the Fed (and Treasury) has undertaken since 2002 has increased that risk. In other words, the set of Fed actions over the years has steadily met the necessary — but not sufficient — conditions that ultimately led to high inflation in other countries. You see, hedging behavior is not absolute, not binary: you don’t have to believe hyperinflation will happen tomorrow to want to increase your insurance against it occurring. When would you increase your insurance? BTW, I was wrong to mention the term, “hyperinflation”, above. This phenomena is exceedingly rare, and it tends to serve as a straw man in the inflation debate. Rather, the risk is of high and volatile inflation. W.C. Varones: The irony of your “joke” is that it was one told by non-rational-expectations economists of rational expectations economists. You really should learn a bit more about economics before pontificating about economics. baychev and Buzzcut: I suggest you suggest Jim Hamilton’s post on Shadowstats, and the BLS report referenced therein, particularly endnote 57.
matthew: The CPI is rising, so there is no deflation in consumer prices at the moment. What is true is certain components are falling, and certain highly visible components are rising — some faster than the overall CPI (energy/transportation, medical care). David: Regarding packaging sizes and inflation — you really should study how BLS conducts its (no apostrophe!) surveys of prices. Silas Barta: Re: paying bills. Answer: yes. Truly, if you think I’m in the ivory tower, you (a) haven’t seen Sewell Hall at UW, and (b) don’t know many academic economists. Anonymous 5:49AM: In this case, “A Man for All Seasons” would be more useful. Earthquake here in New York. NYPD wants to evacuate the building. Inflation shall be measured upon what is consumed, not over an arbitrary basket of goods, not over what is produced. Which supports my point that Gold is a terrible metric of inflation, oil is a good one, and technological products are in fact ‘consumed’ to a greater degree than gold. a far cry from the fictional CPI figures you are quoting that are based on the price levels of goods with lackluster demand. James Hamilton used the official CPI in the article right before this one. So I suppose you think he is wrong. To ignore the force of technological deflation in the 2011 world economy is to think in outdated terms. Gold was a great investment ten years ago, but it’s overpriced right now. If it were such a great basis for running a monetary system, we would have seen the handful of gold-smart economies cleaning the floor with the rest of us. The last few countries on the gold standard gave up ages ago when they couldn’t compete with all the fiat currency types. Gold is a commodity, like oil or pistachio nuts. It goes up. It goes down. It has its uses, but it isn’t magic. Here’s another way of looking at “inflation” and the extent to which “debasement” of the currency has occurred, or not. Look at M2 + inst. MMFs (M2+) as a share of industrial production (IP) to discern the relative rate of growth of debt-money inflation to value-add production and associated capital stock to sustain production. From ’74-’82 M2+ grew at an annualized rate of nearly 6-7% to IP’s 2.7%. IP has not grown at all in 11-12 years, whereas M2+ to IP during the period grew 6%. The US since ’82 has created an order of exponential magnitude of debt-money assets to the underlying productive capacity of the domestic economy. IOW, debt-money since ’99 (the onset of the secular bear market for stocks and the slow-motion depression) has cumulatively grown at an order of exponential magnitude faster than IP, implying that, to achieve essentially no growth of IP, M2+ must now accelerate at a faster-than-exponential rate, requiring avg. annualized growth of 17% (doubling time of 4 years) hereafter. It ain’t gonna happen, folks, or at least not for long. This is what the price of gold is anticipating. Adjusted for debt-money supply and the debt-money supply-adjusted price of gold, the US$ has fallen 80-85% from its cyclical high in the early ’00s; that is, the US$ has already crashed; therefore, it is among the cheapest vehicles (everything else in US$ terms is grossly overpriced, including gold and commodities, stocks, real estate, the euro, yen, etc.) for relative purchasing power hereafter on the planet at present. The larger inference is that the share of debt-money supply attributable to bank lending will contract, i.e., debt-money deflation, at the differential long-term rate of growth of IP and M2+ at 3.5-4%/yr. for the rest of the decade or longer. The only net growth of M2+ (perhaps none at points along the way) will come from further expansion of reserves and currency by the Fed, gov’t net dissavings, if any, and net liquidation of stocks, corporate bonds, and real estate and falling nominal prices hereafter. The bulk of the Fed printing will go to monetizing net interest payments on the US debt held by the public; therefore, very little, if any, additional increases in central bank debt-money reserves will make it to the economy in the form of increasing bank lending or incremental gov’t “stimulus”. 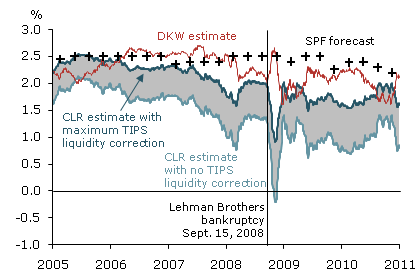 Consequently, I expect M2+ to grow no faster than 2-2.5% for the rest of the decade, with falling multiplier and velocity, stock prices and the S&P 500 P/E falling steadily, and little or no growth of nominal profits (mass consolidation of capacity and many millions more jobs lost in the meantime). As a result of the no or negative returns to equities and 0-2% yields for fixed-income assets, private and public pensions will have to be cut by 30-50% for Boomer retirees. Risk aversion and liquidity preference among Baby Boomers will increase and reach extremes as the decade progresses, as only as few as 10% of Boomers will be able to enjoy what is perceived as “retirement”, with 80% having to rely on meager Social Security transfers, little or no savings, and help from family. Those Boomers thinking they can work in late life will find fewer jobs available and increasing competition from their children and grandchildren. I’m not sure I see the conflict with Matthew’s point of view. First, stock markets react faster in many cases than underlying asset prices. Thus, drilling assets like drillships are again seeing such high prices that Maersk, a company with a drilling fleet, has decided to hold off on new acquisitions for now. If the stock market remains depressed, then that can only mean the economy is in recession (otherwise the stock market would bounce back, I think), and then asset prices will also fall. In the case of oil assets, the fall may come with a decline in economic activity (and oil prices) rather than due to swings in financial markets. High energy prices–and subsequent prices increases in food and other energy intensive products–result from China’s high demand growth for commodities, which is supplied from a productive capacity that is relatively hard to expand. The high price of assets results from China’s high savings rate, which puts additional liquidity into the market. So food “inflation” (mostly a real price increase) and high asset prices can be viewed as flip sides of the same coin, I think. In principal, the gains from low capital costs, cheap Chinese imports, and potential Chinese exports should offset the higher cost of commodities-based products. But there is no clear guarantee, I think, that these are temporally coincident. So the benefit (cheap lawn chairs from Wal-Mart) might precede the cost (higher oil prices). Further, if oil is an enabling commodity, such that other activities depend on it, it is not entirely clear to me that the gains from trade would offset the costs, because the economic losses from high oil prices would be substantially greater than the increased cost of oil itself–at least for the period of time necessary to re-tool the economy to a lower energy budget. Are you aware of what happened the last time gold shot up very high in price? That was over 30 years ago, when were actually having real inflation, getting into the double digit range in the US, with it in triple digits in many countries around the globe. Indeed, in real terms it got even higher than it is today, somewhat higher than $2000 per ounce, a price that it is nearing now. Of course, shortly after getting to that level, it crashed down to about a third of the price it reached in nominal terms and stayed there for a cool 20 years. Yeah, great inflation hedge/store of wealth. As you may know, the earthquake was seemingly centered in northern Virginia. After some investigation, they have identified the source. Apparently, it was the Tea Party, trying to shake up government. Gold is subject to the same re-allocation dynamics as oil, with consumption moving from the OECD to the non-OECD, fueled by rapidly rising non-OECD demand for jewelry and a slowly growing gold supply. Gold is different from oil, however, in that i) it is not an enabling commodity, ergo, shouldn’t bring down the global economy regardless of price, ii) is not consumed like oil, and iii) is purchased as a store of value. Personally, I don’t have a clear sense on the split between gold as store of value and gold as jewelry. But I can tell you it’s not 1983. I would anticipate that gold would continue to appreciate in value (over the long term, at some pace), and will come to be perceived more the way we have traditionally thought of diamonds. I think the world of affordable gold jewelry is probably gone for good. Menzie suffers fools gladly. Don’t know how you can expend the intellectual energy. Yes, I’m quite familiar with gold’s history. And it may indeed have a sharp pullback after its big recent run. Gold is volatile but holds its value extremely well over the long run, something that cannot be said of dollars. I can hold through volatility. I know you have had a little exposure to portfolio theory. Look at gold’s returns, volatility, and correlation with other asset classes during fiat currency regimes, and I think you’ll discover that a small allocation to gold is an essential part of any balanced portfolio. The “irony” of your comment is that while I am quite aware of the background of the joke, that is completely irrelevant to the current discussion. In case you still don’t get it, it was a reference to certain economists who don’t let the facts get in the way of a good theory. W.C. Varones: But it’s you that — when confronted with the fact that money is not losing value against a bundle of goods at an particularly high rate — redefines a phenomenon so that the facts “fit” (debasement is now increasing quantity — when the money supply has been increasing pretty much since 1776). So it seems to me that you’re the person insisting the $10 dollar bill isn’t there. Now you’re just repeating yourself. Please go back and read my original comments. Your definition, that debasement = CPI, may well be the only definition of debasement that you and your professors ever considered, but it is not the only definition. Nor is it the historical definition, the dictionary definition, or, in my humble opinion, the best definition. Yet instead of considering my argument, you just keep stating that debasement = CPI. If you’re not even capable of considering the idea that the Fed can “debase” the dollar while economic conditions keep demand and inflation low, then there’s no point continuing this discussion. Finally, for those still under the misconception that the dollar is a store of value, please see the calculator on the Minneapolis Fed’s own web site, and see what’s happened to the dollar since the Fed came out in 1913. There’s a graphical representation here. And yes, I know that you take low-single-digit inflation as both a given and a good thing, another assumption you might want to question some time. W.C. Varones: Hmm — you stated quite explicitly the CPI was not a valid indicator of debasement. That’s the first line I quoted. Then you throw out a bunch of other definitions that involve quantities. Well, I think you are right that the discussion has reached the point of diminishing returns, and we let the readers decide upon what definition of debasement makes most sense. By the way, you still haven’t answered why you keep on calling Fed Chair Bernanke “Zimbabwe Ben” if it’s not an allusion to hyperinflation (admittedly, hyperinflation as conventionally defined by us narrow-minded macroeconomists as the rapid loss of money’s exchange value against a bundle of goods). The Germans started printing in 1918. Inflation was moderate just like now. 22 was when it took off. Yes, “Zimbabwe Ben” is obviously an allusion to hyperinflation, but it is intended as hyperbole and humor, not as a prediction of imminent hyperinflation. I cannot take credit for the “Zimbabwe Ben” moniker. It was coined at Skeptical CPA and popularized there and at Jr. Deputy Accountant. Does Bernanke know that he’s totally screwed, that he has the power to create asset and commodity inflation but not to match it with wage inflation? Crude was $80 then, gold was $1237, and the S&P was at 1170. QE2 drove all three much higher, while wages remained stagnant and unemployment remained horrible. Crude and the S&P have since fallen back as demand remained weak. All of this is consistent with the dollar being debased while the sick economy keeps a lid on consumer inflation. Your perception of technology is flawed: you are looking at megabytes, RAM, not at raw inputs, not by marginal utility. If you take smartphones, tablets for example, they pack a lot more MB/CPU clicks, but their utility is constrained to consumption, whereas you need a PC for production. Furthermore, on Win XP you can do about the same work with VS2005 that you can on the latest Win 7 & VS2010. The utility is roughly the same, the real price is slightly up, the CPI used price has deflated. This is biased stats with the clear intention to deceive. Yeah, the CPI wasn’t really the point of my comment – the rate of change is low, it’s fair to say. What I was asking is whether it’s possible you could have low inflation in consumer goods and high “inflation” in investment goods, because of huge shortages of quality products. Simon – I don’t see the irony there. The S&P might simply be composed of poor quality investment goods. A better irony might be the US Treasury is producing high quality investment goods as fast as it can. Gold is a poor substitute to use as a measure of inflation fears. It is a good substitute for economic fears. Gold does very well during periods of deflation. Gold is not a currency and there is not adequate supplies of it to establish as a currency in a world wide economy. It is only portable in small quantities. Blips move more money a lot faster. In times of a true crisis gold may be worthless. I suspect that is the truth of modern gold. Since the only value in gold is what individuals assign to it, in a collapse of society, do you want to go fishing or hold onto your gold? Everybody gets it that gold is not, in and of itself, a currency. All the same, when one can walk into businesses such as barbershops (at least two that I know of in NYC) and sell your gold at spot, then it might as well be. “Please don’t feed the trolls” is very sound advice. Posts like this not simply a waste of time, they’re counterproductive. I can’t be the only econbrowser fan whose browsing experience is suffering from this. “Trolls” is a pejorative most commonly used by insecure, narrow-minded people afraid to have their worldview challenged. On the matter of whether we will see a repeat of the Ford/Carter years with inflation rates well north of 5% for many years in a row…I think that is possible. I agree that fluctuations in the monetary aggregates are next to useless in predicting long term price changes. However, I don’t think that is where the risk lies. When currencies were based on gold, general price inflation occurred whenever substantial new supplies of gold were found. Not all of that gold was minted into money. It was the relative supply of the underlying asset, not the aggregate money supply that drove the increase in prices. US Treasury debt is a claim against future tax revenues. The US economy exists now and creditors presume it will go on existing. The US government exists now and creditors presume it will go on existing. Just like refining gold ore into bullion, the US Treasury converts future tax revenues into an asset (debt) that can serve as the basis for a monetary system. If one goes back and looks at the 1970s, Federal debt more than doubled in a decade while real GDP increased ca. 40%. If a monetary base (in this usage I mean debt, not M1) increases in pace with the growth in the economy, one would expect price stability. If the monetary base increase far outstrips the growth in the economy…one expects inflation. And that’s what we got. So…circling back to the instant discussion, everyone expects the US debt to increase dramatically over the next 10 to 15 years and the GDP…ehn, not so much. Thus, I can envision Ford/Carter style inflation in our future. Perhaps the best counter argument to what I wrote above is Japan (stratospheric debt with stagnant or falling prices). Before anyone offers that up to me, I would point out that well over 90% of Japanese gov’t debt is held by the government or agencies strongly allied with the government (analogous to the SSA holding a big chunk of US debt). So, a large portion of assets on which the yen is based is not a freely circulating asset. Contrast this to US Treasury debt, which is freely traded throughout much of the world. Furthermore, Japan’s forex account (in US$) is ca. 10% of the world float of the yen (valued in US$). One could argue that the yen is a bad counter argument to the proposition I presented above because Japan has aggressively maintained the status of the yen…or, perhaps, they had no choice but to work for deflation as their 20+ year experiment with QE would have blown up with significant inflation.